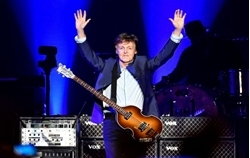 The wisdom of Macca: what Paul McCartney told students at the college he founded . Beatles Radio: The Beatles, Solos, Covers, Birthdays, News The Fab 4 and More! Offering a “new approach to performing arts training” LIPA offers arts training that is both different and out of the ordinary – a bit like McCartney’s own music training which had little formality. In his chat today, McCartney shared his wisdom on why old school recording techniques are still the best, why musicians should return to making “concept albums” and why, crucially, the bathroom is the best place to write your music.